An increasing trend in the current times, particularly among the retail sector has been the multichannel supply chain strategy. Under this strategy, the companies are aiming at creating an “in-house” distributing facility for order fulfillment operations, thus saving significant costs on distribution performance. This has resulted in rapid penetration of automation technologies in warehouses. Warehouse Robots are designed specifically to cater to functions including storage, sorting, assembling and disassembling, trans-shipment, distribution, replenishment, packaging, labeling, inspection, consolidation and so on. Automated Guided Vehicles (AGVs) and Fixed Robots including Gantry, Articulated, etc. are the robots which are incorporated at various locations in a warehouse and these functions in coordination to serve the aforesaid applications. Several factors including type of materials, workload and capacity of storage facility and so on are to be sorted before employment of these robots. There are several associations such as IFR, JARA, BARA, RIA and many others that have been referred as authentic sources to determine the industrial robots supply in the past. In the total warehouse operating cost, the labor cost is highly significant contributes about 60%-65% of the total warehouse operating cost generally. The presence of both direct and indirect staff coupled along with department managers presents a crucial cost in operating a warehouse. Thus, the warehouses automation level has become a mean to tackle the rising wages and workforce age problems, at least in developed nations. The autonomous machines which are programmed for various material handling tasks carried out to efficiently stock the raw materials, semi-finished and final products in storage sites and warehouses are known as warehouse robots. The robots may be mobile or fixed depending upon the application for which they synchronously work. Simultaneously they convey the inventories across the warehouse. Industrial automation impregnating into several industries has fuelled the deployment of these robotic systems for efficient manoeuver of the inventories across the warehouse floor. Warehouse robotics is the implementation of these warehouse robot systems or the deployment of robots for fulfilling the requirements in the industry. What are the major applications for Warehouse Robotics? Various processes in the industry including loading, unloading, sorting, picking, transportation, storage, delivery and audits are assisted by warehouse robots. Robots which help with these tasks are of varying shapes and sizes and even help in keeping the track of job they do. Different forms of navigation tools such as rail, wire-guided, labels, magnet tape, laser, vision, geo-guidance and others assist the warehouse robotic systems to function according to need of the task. 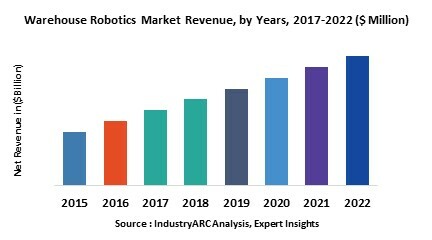 Robotic equipment and systems that do not require a large infrastructure and high capital investment have been preferred application of logistics robots. Robotic warehouse systems are used in wide range of industries including textile, chemical handling, mining, defence, construction, airports and so on for implementing effective services or to enhance the quality and ease of work. There has been a high interest in automation of almost every physical move in their facilities shown by largest DC/FC operators in the U.S within the next two to three years. Robotic automation will help the operators as it gives the capability to extend the capacity, hours of operation, and life of a DC/FC. Increasing wages demanded by laborers and lack of available workers makes the economics more attractive. Robots are more affordable than ever and their implementation is more justifiable than in the past. AR has been seen as one of the key element for the integration of the human workforce into the digital factory of the future. With the implementation of AR techniques the interfacing with the systems has been becoming more convenient. A timeline of three to five years has been predicted by most of market participants for becoming a mainstream component of the future industrial landscape. The digital factory concept has shown a transformative cascade effect on the ecosystem. If digitization of parts of shop floor operation, or more importantly, its warehousing and logistics solutions is done by one of major manufacturer, significant pressure is put on wider supply chain also for adopting digitized approach to retain business and sustain in a cutthroat competition. Simultaneously it forces competitors also to incorporate these technologies. AI personal assistants products like Amazon’s Echo Dot and Google Home have been innovative and have shown that in the future robots technology has high possibilities to get easier and cheaper. The cost for implementation of warehouse system with the cost of the physical robots, also currently includes the time and effort spent training the AI. To equip warehouse to be robot friendly techniques such as tracking on the floor for guidance to tagging every product, shelf, door and station help to ensure that the automated warehouse robots know where to go and what to do at all times. Who are the Major Players in Warehouse Robotics market? The players profiled in the report include SSI Schafer (Germany),Daifuku Co., ltd. (Japan),Dematic Corp. (U.S),KUKA AG (Germany), Vanderlande Industries Inc. (U.S), ABB Ltd, Yaskawa Motoman Robotics, Wynright Corporation, Seegrid Corporation, Swisslog Holding Ag.